The Mille Feux, medium 1 light Tiffany table lamp uses many pieces of cream Tiffany art glass in a geometric pattern, and is inlaid with glass bead work. 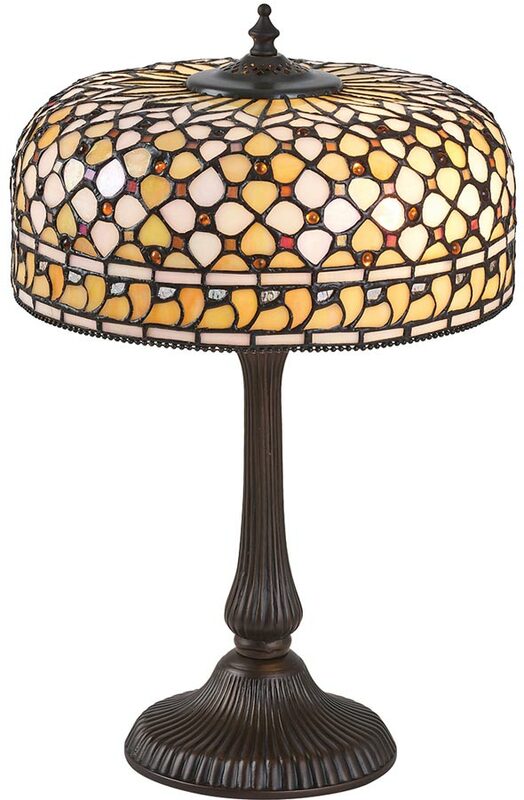 A medium Tiffany table lamp, with a wide Mille Feux Tiffany shade. Finished in dark bronze, with a flowing ridged design and an elegant inverted shaped stem. Fitted with an inline cable switch. Mille Feux translating to a ‘thousand lights’. We haven’t actually counted how many sections of glass the Mille Feux has, but its meaning is clear when you see the amount of glass pieces used to create this Tiffany lamp. Beautiful warm golden blends of cream and honey tones are used in this magnificent Tiffany design. The Mille Feux, medium 1 light Tiffany table lamp, designed and manufactured by Interiors 1900.